Hi! The clock is ticking down to the final stretch of holiday prep. As is the case every year, the weekends fill up quickly with holiday parties and while I often think I have a lot of time to get ready (and find things to wear), somehow I’m left the week of the holiday rushing around tying up last minute items. Parties and social events aside, I think the holiday ready items in my closet could cover a month of work and parties, yet every year I am adding more sparkly, lacy, metallic items to my closet (I. Can’t. Help. It.) Two items that I have been wanting to add to my holiday rotation are a lace dress and a fur vest. One of my other favorite stores at the Fashion Outlets of Niagara Falls, USA is the Banana Republic Factory Store. They always have an excellent selection of items and I am familiar with a lot of the retail offerings so I like seeing the same styles in different colors or options than what I’m seeing at the retail store. I can always count on finding key items and I wasn’t surprised when I found this fantastic lace sheath. I like the versatility of the dress and I would wear a black cardigan or blazer and tights to work and swap out the blazer for a more festive fur vest or cashmere wrap for evening events. Admittedly, dressing in cute holiday garb can be difficult in the Northeast and I am always trying to find ways to wear all of the fun short-sleeved and sleeveless items and not freeze to death. So, while I’m not wearing stockings in this photo, I would definitely opt for tights in this climate. However, I do find once I’m happily tucked in to my party with a cocktail, I always end up shedding my long sleeve layer, so I suppose the short-sleeved dress isn’t that far fetched. $50 Fashion Outlets Visa® Gift Card Giveaway – We have a winner! I will be contacting you via email with details. Hi! I can hardly believe that we’re staring down the Thanksgiving holiday next week. While in the past few years we’ve started seeing Christmas decorations in the stores before Halloween; for me, the Christmas holiday season starts with Thanksgiving, followed by Black Friday. I have a love hate relationship with Black Friday. For years, I worked retail and that inevitably meant working the day after Thanksgiving. So I was always at the mall, whether I wanted to be or not. And I was there, so I always ended up doing a little shopping! In the years that followed my stint in retail, I wasn’t up with the early birds to go shopping on Black Friday but I inevitably found myself at the mall later in the day or at some point in the weekend catching up with out of town friends for drinks while scoping out the deals. For years, the Fashion Outlets of Niagara Falls has been in my regular shopping rotation. In many cases, they had (and still have) stores that you couldn’t find at the local malls, such as Kate Spade, Burberry, Cole Haan and Saks Off Fifth. Scoping out the designer deals at Saks Off Fifth was always a worthy way to spend a few hours of shopping and I have scored numerous deals over the years that I’m always excited to share with others. I’m a big online shopper mostly due to my schedule but if I have a day off from work, hitting up the Fashion Outlets of Niagara Falls is almost always on my shopping agenda. And ever since they’ve remodeled and added on new stores (and parking!) I am even more inclined to make a trip. Inevitably, I was thrilled (and a little overwhelmed!) to be asked to partner with the Fashion Outlets of Niagara Falls to showcase some holiday looks that can be found at their stores. As someone who spends most of their week in business casual clothing, I tend to stick to a fairly classic weekend uniform. 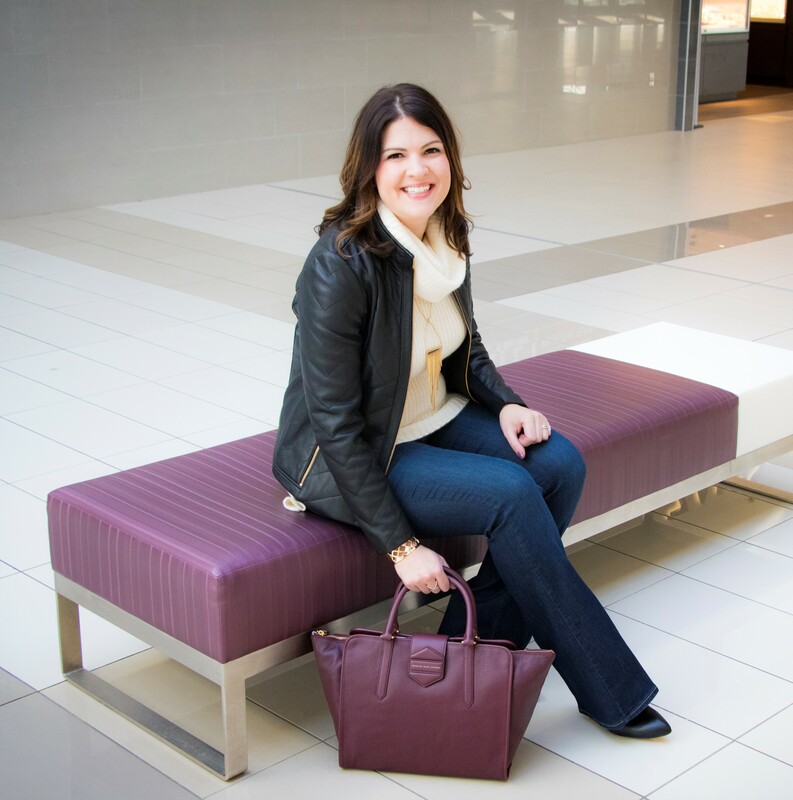 During the fall or winter, if I’m shopping or heading out with my husband or girlfriends after a long week at work – I’m almost always in jeans, a blouse or sweater with a cute jacket and boots. I had grand intentions of trying out new stores but in case you can’t tell from my past blogging – I’m a bit of a creature of habit. A walk through Saks Off Fifth and I found myself a perfect Thanksgiving weekend outfit. Paige jeans? Check. Cute chunky sleeveless cashmere sweater? Check. Fabulous quilted leather jacket? Check. A beautiful handbag and some heeled booties to finish of the look? Check and check. 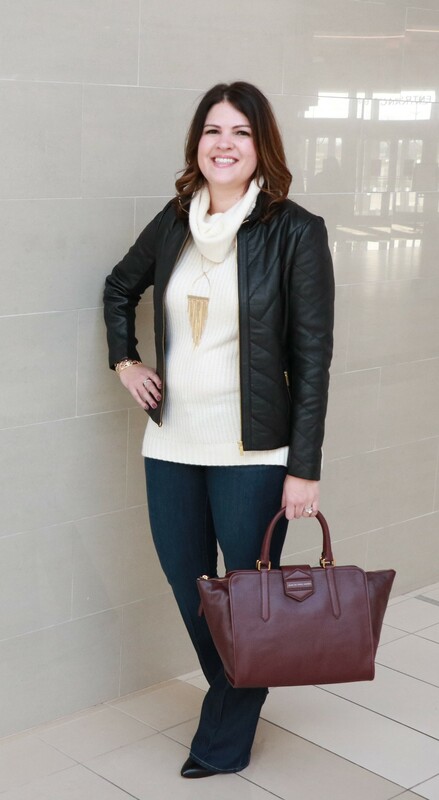 I am all about a neutral weekend outfit with a kick of color via my handbag. I would be carrying this color handbag even if it wasn’t an “it” color. Denim wise, Paige jeans have been my go to for a few years now. They’re comfortable, they have the coveted stretch and they are flattering on my curvy figure. I have several pairs of their straight leg jeans and I am thrilled to see the bootcut trend come back in the last few years to add those to the rotation. And I hardly ever pay full retail for these jeans. Saks Off Fifth has a fantastic selection of current designer denim for a fraction of what you’ll pay elsewhere. I’m a solid 31 in most Paige jeans these days (usually wear a 12 on bottom). I got a bit of side-eye from the hubs on this sweater. Why would you wear a sleeveless turtleneck? What’s the point? Well, I’m someone who usually gets pretty warm when I’m shopping or out with friends so for me, it’s the perfect layer under a jacket but I’m still warm in cashmere if I decide to shed my jacket. I was pleasantly surprised with the quality and the selection of Saks’ own brand of cashmere and I will be paying closer attention to their items as I add sweaters to my wardrobe. A polished leather jacket and heels pull the outfit together for me. Not unlike designer denim, a leather jacket can be an investment, and this is another item that I refuse to pay full retail for when I have a full designer collection at my disposal at stores like Saks Off Fifth. They carry more classic styles like this as well as edgier moto bomber styles (believe me – I had trouble deciding which jacket to choose!) Shoe wise – where do I begin? The shoe section is always my first visit at Off Fifth and I almost always find something that needs to come home with me. Heels were essential with the bootcut jeans and since I can hide some socks inside a pair of booties – it’s a no brainer. Whatever your shopping desires, the Fashion Outlets of Niagara Falls has you covered. Are your Thanksgiving festivities wrapped up early and you’re looking for something to do that evening ? If you’re looking to beat the crowd, you can hit up the Fashionably Late Black Friday Event at the mall which starts at 8 PM on Thanksgiving evening and runs until 2AM. Will you be in a turkey and wine haze with your family or friends on Thanksgiving and want the full Black Friday experience the next morning? The mall opens at 6AM and is open until 9PM on Friday. Several stores, including Banana Republic Factory and Kate Spade will be open all evening. Saks Off Fifth even has early Black Friday sales going on and you can see any of the current sales at the mall here. To get you kick started on your holiday shopping, I will be hosting a giveaway for a $50 Fashion Outlets Visa® gift card redeemable at the Fashion Outlets of Niagara Falls, USA. Stay tuned to Facebook and my Instagram page for details. So, are you a Black Friday shopper or do you prefer to shop online? Would love to hear what you think and thanks for visiting! Thank you to the Fashion Outlets for hosting me and stay tuned for another holiday party look featuring the Fashion Outlets of Niagara Falls!